Thousands of people visit Burnham-on-Sea every year to stroll along the uninterrupted seven mile expanse of sand, take a ride on a donkey or enjoy a coffee on the shortest pier in the UK. 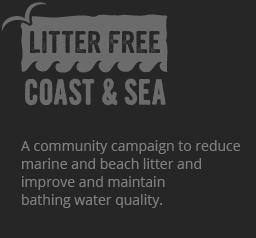 However you like to enjoy the beach you can help us achieve cleaner beaches and seas by following six simple steps! Bathing waters are key locations at a beach where the highest number of people swim and paddle. The water quality is tested at these designated areas by the Environment Agency to check how many bacteria are in the water. The bathing water quality is classified using the revised Bathing Water Directive based on the amount bacteria in the water when the sample is taken. What is the revised Bathing Water Directive? The revised Bathing Water Directive sets out standards of water quality based on how much bacteria is in the water when a water sample is taken. By measuring how much bacteria is in the water we can tell how clean it is. In 2015 a new directive was introduced which included a new classification system with more stringent water quality standards and a larger emphasis on providing information to the public. Since November 2015, bathing waters have been classed as either excellent, good, sufficient or poor. The water quality standards for the new classifications are much higher than those of the original bathing waters directive. What affects the bathing water quality at our beaches? Bacteria can come from many difference sources, which include pollution in the sea, litter and dog poo on the beach, or from water washed into the sea from inland, particularly after heavy rain. 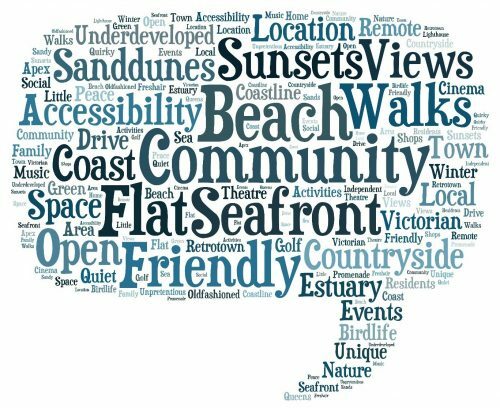 When Burnham-on-Sea residents were asked what they love about Burnham-on-Sea this word cloud shows their answers. You can see the community means everything to people in Burnham-on-Sea but so does the beach! 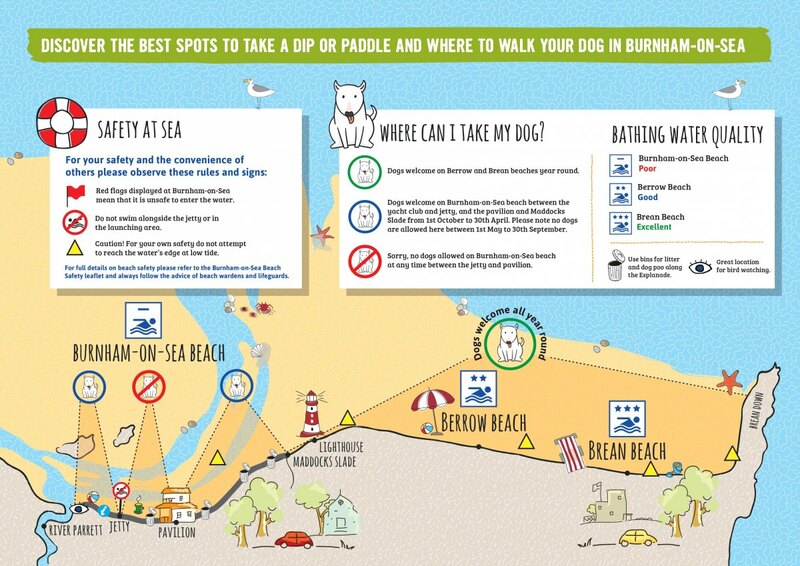 Our challenge now is to make sure we can get the bathing water classification up to ‘sufficient’ to make sure local people aren’t put off from using their beach and visitors continue to come and enjoy Burnham. 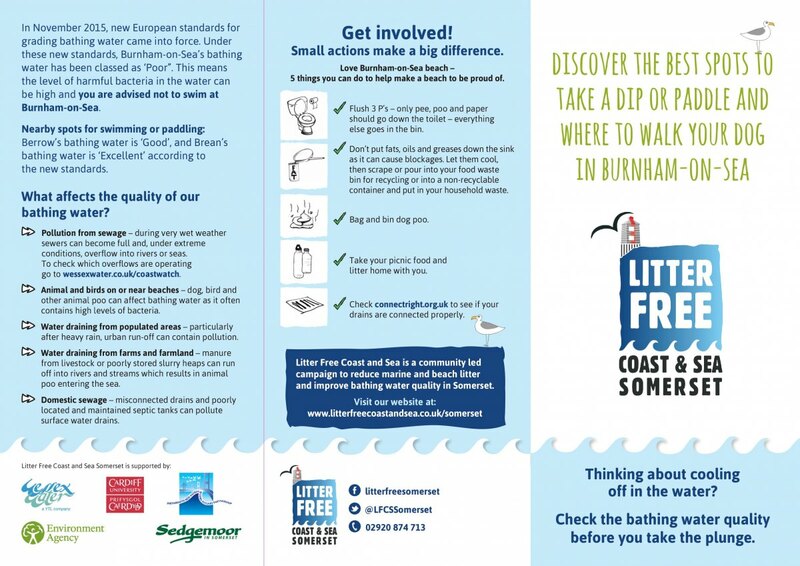 Litter Free Coast & Sea Somerset supporters want bathing waters to be even cleaner and all our beaches to meet the standards. We’re working together to raise water quality standards in Somerset so please get involved – small actions can make a difference.